Here you will find a collection of floor cleaning tips that many high-end cleaning professionals use. 1- To clean up a broken egg on the floor, pour salt over it and wait for five minutes. Then sweep up the dried-up egg. 2- Use toothpaste to clean up crayon scribbles and an eraser to remove heel marks from a vinyl floor. Floors take the brunt of our activities. They endure scuffs and grime from our shoes, pressure from furniture, and all kinds of flotsam, jetsam and other dust particles looking for a home. Floors should be cleaned, and carpets vacuumed once a week. A cup of vinegar in a bucket or sink full of warm water is an excellent cleaner for almost any floor. For rooms that get heavy use, such as the kitchen and bathrooms, minimize once a week cleaning chores with daily sweeping. Shake outside or vacuum small rugs, and move chairs aside so you can reach underneath tables. Pick up pets' dishes, and sweep or vacuum. Each of the floor cleaning tips below begins with vacuuming or sweeping to pick up crumbs, hair and whatnot. Use the hose attachment to get under cabinets and into hard to reach corners. Wood -- Remove bad scuffs or other spots with a drop of lemon essential oil, or tea tree oil if the wood is light colored. Another brilliant spot remover for wood is a drop of lavender oil mixed with a drop of lemon juice, applied with a damp scrubbing sponge. For entire surface, dip a soft rag into the vinegar and water mixture. Wipe by hand or attach the rag to a Swiffer mop. Never allow water to stand on floors or the wood will soften and begin to warp. Finish with a vacuum. 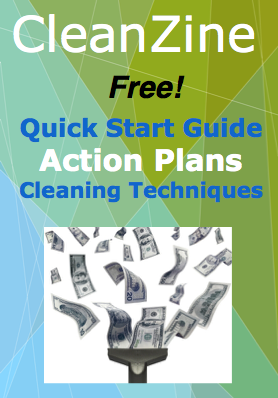 Sign up for the CleanZine Newsletter and receive free Action Plans and a Quick Start Guide. Tile -- Damp mop with the vinegar and water mixture. Use a nonabrasive pad for scouring spots. Dry with a soft cloth. The vinegar wash will help the floor keep its luster. If you use a different all-purpose cleaner, put vinegar in your final rinse. Grout -- Use a toothbrush for removing stains in grout. Spray on tile cleaner and rub. Stone and Slate -- Damp mop with a sponge mop using the vinegar and water solution. Apply slowly with even strokes and enough pressure to pick up dirt. Vinyl -- Use a damp mop to clean, then mop a second time with the vinegar and water mixture for a healthy shine. Then vacuum. A scouring pad will remove heel marks. White vinegar in the rinse will neutralize alkalinity and make it shine. This is an excellent article on cleaning hardwood floors. These are the wood floor cleaning formulas that we use everyday at Custom Clean. Learn all about the benefits of starting your own cleaning business. What is lost key and lock coverage for a cleaning service business? House Cleaning Business Cards dos and dont's. Properly branding your house cleaning business is very important to your success.